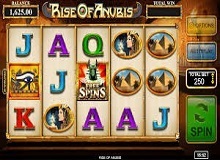 The Rise of Anubis Slot by Inspired-gaming can keep you hooked for a long time as you spin these reels and chase opportunities to win some money. But you will also have a lot of fun as you do that so this is nothing like a boring game. As you play Rise of Anubis Slot for real money, you will be able to identify features and aspects that will make you fall in love with this machine. Here’s why you should give these paylines a fair try and enjoy some exciting rounds! 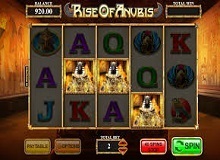 The Rise of Anubis casino Slot online is one of the most appreciated arcade machines. It comes with an RTP of over 96%, and it can be found at most casinos online. The theme of this arcade machine is dedicated to the ancient God Anubis who can bring you plenty of opportunities to win with each pay line. The graphics that this one comes with are very attractive as well, and the atmosphere is an inviting one. The symbols that you will find are related to Egypt, and the God Anubis and plenty of them are related to gold and fortune. Also, the soundtrack of this arcade machine is perfect to complete the ancient Egypt theme and create the right atmosphere for the player. As you play Rise of Anubis Slot machine online, you will discover that there are no special cheats, tips or tricks to build your playing strategy. It doesn’t mean that you can’t land the winnings that you aim for by simply following the rules of this game. This is a 5 reels slot machine with 20 paylines to activate as you wish. You can make winning combinations by landing minimum three matching symbols. There are ways to increase or decrease the bet value by using the buttons placed on the screen of the machine. There’s not a max bet feature so if you are confident enough to activate it for all the paylines you need to do it manually. You can bet as low as 0.20 credits, and if you feel confident, you can even get to 250 credits in bets. There is a wild symbol that can appear anywhere on the reels and replace other icons to give you matching combinations. There’s a super wild as well, but you can get this only on the 2nd, 3rd, and 4th reel. Both types of wilds do the same thing and bring the same benefit to the gambler. As much as some players would like to, there is no scatter in this game. But that doesn’t affect the winning possibilities offered by the machine. The more you engage in this game, the more you might be charmed by it. 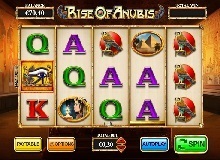 And if you don’t want to risk investing a lot in the betting section, you can try to play Rise of Anubis Slot free, as it does come with such an option. But this is perfect and a lot more enjoyable for those gamblers who like to take chances. And this machine might surprise you from the very first rounds, so there is no need to underestimate it! This online casino is a great starting point for many beginner players who want to get in the realm of gambling. You will be able to make some income if you are confident in yourself and persevering when it comes to placing the right bets and keep spinning. This can create an amazing adventure for all players who try to be successful at online gambling and create their playing strategy. You can make some money at this game but this is not the main quality of this game. You might be disappointed to find out that this one doesn’t come with special bonuses or jackpots. But you will be glad to hear there are free spins and multipliers to enjoy. 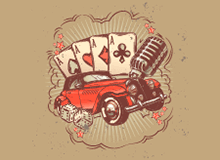 The maximum amount of free spins that you can get is 10, and the multiplier can get up to 50 times your bet. As you can see, this is one game that will walk you through the learning path of online gambling. You will understand how slots function and what you can do with them after each round. And by the time you will master this machine, you will be ready to invest in more complex and challenging slots with themes of your choice. However, this is a perfect one even for expert players who might discover that they are naturally successful at spinning these reels since they are already familiar with the format. Summary: Rise of Anubis Slot will charm you with a classic Egyptian theme that also brings you the possibility to improve your balance and enjoy several rounds of fun!